Propel your organization forward with collaboration solutions that free you to move at the speed of thought. Manage all your communication technology with integrated monitoring and reporting. No matter how complex the need, AVI provides comprehensive communication technology solutions. Expand your reach with meeting room solutions that enable easy communication across the world. AVI Systems provides specialized audiovisual and collaboration solutions for all major industries. Move faster. Compete more effectively. AVI solutions for business are catalysts for growth. The world becomes your lecture hall with solutions tailored to the needs of educational institutions. Money knows no borders, nor do the communication technology solutions we can bring to your entire organization. Extend your reach to patients, providers and partners regardless of location. Access communication technology solutions that make government more efficient and responsive. Harness our power to help reach people far beyond your physical space. Create more powerful, vivid and immersive experiences across the realm of entertainment. United in our mission and guided by shared values, employee-owned AVI Systems has become a leader in our industry. Led by industry veterans and visionaries, AVI System has become one of America’s preeminent communication technology providers. Extraordinary expertise meets uncompromising commitment in the employee-owners of AVI Systems. AVI provides an environment in which every member of the company has the opportunity to learn, grow and succeed. A pillar of our success: longstanding partnerships with the industry’s premier communication technology providers. See how our growing family of companies keeps AVI clients on the technological forefront. AVI Systems delivers communication solutions via a step-by-step, collaborative process tailored to your unique needs. All AVI solutions are built on a solid bedrock of understanding. By involving our clients at every stage of the design process, we create solutions tailored to your unique needs. Before we install your solution, we rigorously test it to ensure its functionality and reliability. AVI Global PRO Support ensures your technology performs as promised, day in and day out. Before we begin work, we provide a detailed scope of your project. Responsive, reliable and flexible, AVI Global PRO Support ensures you get maximum value from the solutions we provide. We don’t just provide solutions, we have the resources to keep your system up and running long after installation. AVI provides coverage that extends far beyond manufacturers’ warranties. Count on AVI for real-time support to keep your conferencing technology functioning. In addition to providing the technology you need, we’ll help you build a team to run it. We not only prove your communication technology solution. We pre-prove it in the AVI Interoperability Lab. We participate in a range of industry events and regularly hold our own. You’ll find the latest listings right here. Browse our case studies for real-world examples of how AVI helps our clients get the most out of today’s communication technology. Stay up-to-date on AVI and the industry we lead. Visit our blog page, or receive our latest posts via email. View a wide range of videos on news and events spanning the world of communication technology. Take advantage of our sophisticated search function to zero in on the content you need. Count on AVI for broadcast media solutions that enable you to manage and share digital assets more efficiently than ever before. Access a unique business practice created from the ground up to enable your business strategies. Communicate with unprecedented power and immediacy in a vast range of applications. Welcome to the one blog for all things AV-related. Once ICL Performance Products decided it was time to expand its Food Specialties Center, the global manufacturer realized it was going to need a technology update as well. ICL is a manufacturer of functional ingredients for the food industry, as well as a wide variety of industrial and fire safety products. The company is a global leader in phosphate-based engineering and production. The company’s reach extends around the world with manufacturing sites, sales centers, and additional spaces. This made it even more crucial to have audiovisual (AV) solutions working in a way that’s going to meet contemporary demands and expectations. Download the case study to read more about how AVI Systems helped ICL achieve global connectivity. 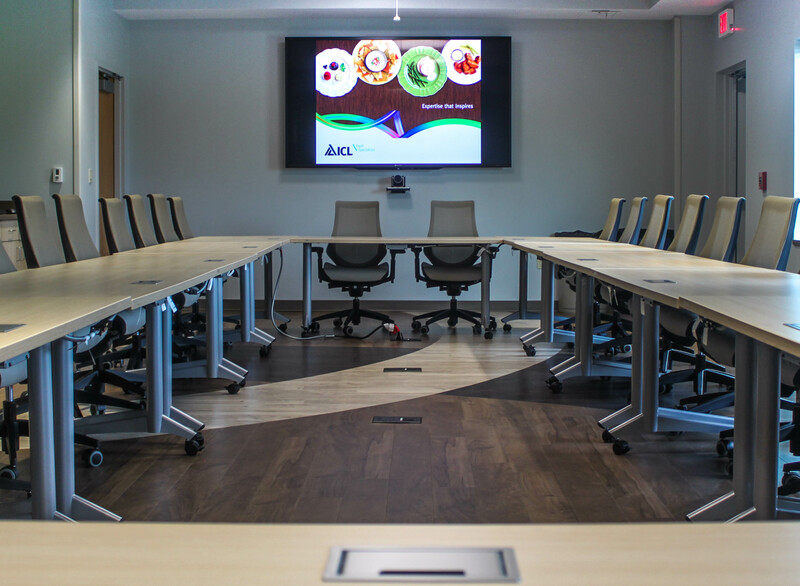 Before expanding, ICL’s center boasted a basic AV setup – a pull-down screen and a ceiling-mounted structure – which left them lagging behind. ICL wanted responsive support on AV matters. The company needed a more interactive solution to engage its clients and create an environment of seamless communication. And at the same time, the solutions needed to be easy to use so employees could adopt them without hassle. “Having the technology to being too cumbersome for people to use, and not use it, that was a big fear,” said Vince Machen, facilities coordinator at ICL. Among ICL’s goals for the new space was to have rooms for customer demos, featuring technology that left a lasting impression. To do this, Machen needed to find AV solutions that were going to hit the mark and bring this manufacturer up to speed. 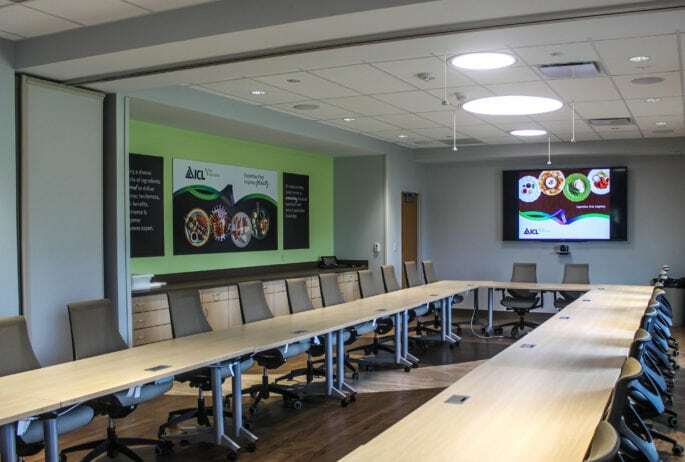 This project was going to overhaul a great deal of the new center’s space, including the lobby, conference and huddle rooms, and a test kitchen. Machen looked to AVI Systems as the ideal technology integrator. Complete this form to get the latest news, event information and technology tips delivered right to your inbox. Why AVI for Digital Signage Solutions?